Jewell Reed stands in her kitchen as she puts the finishing touches on lunch: roasted lamb with a side of green beans, salad, scalloped potatoes, bread with homemade jam, and a strawberry tart for dessert. She’s wearing a pink sweatshirt adorned with cartoon sheep. All of them have white wool, black faces and red hearts on their side, with the exception of one, classic black sheep. Behind her on a wooden shelf by the refrigerator sits a collection of songbird figurines, paintings, and felt art portraits. In the living room, metal artwork of songbirds on a power line sits above felt art of chickadees and a photo of a mountain bluebird. Would this art collection signal that Jewell is a big fan of birds? “Well yes, why wouldn’t I be?” she laughs. Reed Ranch is located in Wyoming’s Thunder Basin, where the rugged sagebrush sea collides with the shortgrass prairie. Known for its economic prowess in both agricultural and energy production, the Basin’s unique habitat conditions also support a wealth of native wildlife including songbirds, mule deer, prairie dogs, and greater sage-grouse. Although Reed Ranch is a sheep and cattle operation, wildlife conservation is part of the business model. All of their ranch is certified as “bird friendly” by the National Audubon Society. 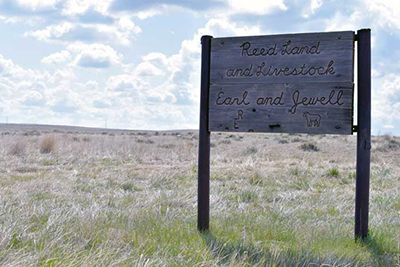 In addition, Reed Ranch is one of over 20 ranches participating in the largest voluntary conservation agreement in U.S. Fish and Wildlife Service history. In the American West, ranchers are crucial partners in wildlife conservation efforts because successful ranches and healthy wildlife populations often go hand-in-hand: acres of open pasture with lush grass or patches of healthy sagebrush, minimal human development, and easy access to water is just as appealing to livestock as it is to wildlife. But sometimes, broad appeal can lead to conflict. Back in 1999, the conflict was with prairie dogs. Recognizing the need to balance healthy populations of wildlife, livestock, and economic development over the long-term, Jewell’s late sister-in-law, Betty, formed the Thunder Basin Grasslands Prairie Ecosystem Association. Comprised of a coalition of land stewards from local ranches, mines, and an oil and gas company, the Association was founded in 1999 and Jewell has served as treasurer ever since. Betty's son, Dave, is the organization’s executive director. Over the course of many years, the Association spearheaded the development of a voluntary conservation strategy with the Service and other partners across the Thunder Basin's patchwork of public and private lands. Finalized in summer 2017, the strategy uses a combination of proactive conservation tools, including a Candidate Conservation Agreement and Candidate Conservation Agreement with Assurances, to contribute to the conservation of 13.2 million acres, two distinct ecosystems, and eight species of wildlife in-need including the sagebrush sparrow, Brewer’s sparrow, sage thrasher, black-tailed prairie dog, mountain plover, burrowing owl, Ferruginous hawk, and greater sage-grouse. Another beneficiary of the arrangement? Meadowlarks, Jewell’s favorite bird. “Oh, they've such a cheerful song,” she says, her face lighting up. Although meadowlarks are not formally covered under the agreement, the Reed’s bird-friendly ranching practices help to conserve meadowlarks as well. Born and raised in rural Wyoming, Jewell Reed has called America’s sagebrush country her home for her entire life. Today, Reed Ranch raises hundreds of Rambouillet sheep, a French breed partly descended from Spain’s treasured Merino flocks. Their fine wool has softer texture and is used to make articles of clothing like sweaters, whereas coarse wool is used to create rugs or heavy coats. The Rambouillet are also prized for their meat, most of which makes it way to restaurants and international markets in New York City, where the demand for lamb is higher than in other parts of the country. Raising a healthy flock requires constant care and attention. Every day at 4:00 p.m., Jewell heads to the barn to check on the lambs. “She has a knack for seeing things the rest of us might miss,” says her grandson, Monte. When Jewell makes her way through the stalls she carefully eyes every ewe and lamb, nudging any snoozing youngsters with her iconic wooden shepherd’s crook. If anyone shows sign of a problem, the pen is flagged with a piece of colored cloth, each color representing a different concern to be addressed. This concern that Jewell and ranchers like her show for their livestock can spill over into other areas of life. “There is a saying that, ‘what the eyes don’t see, the heart doesn’t feel,’” Jewell shares. “Most of us care quite a bit about the wildlife—we like ‘em, so we do try to do whatever we can do to help them, or at least not to harm them. “It’s the same way you ranch. Most people aren't ever going to get rich ranching. You care about your livestock, and I guess people that care about wildlife and livestock probably care about other people too, when you get right down to it. It's a way of life that we like,” she says with a smile. Lunch is ready and the table is set. Jewell buzzes the barn on the intercom to summon the assemblage of children, in-laws, nieces, nephews, grandchildren and great-grandchildren on duty. Over in the barn made of wooden floorboards salvaged from an old Veterans building, baby lambs are bleating and nursing. 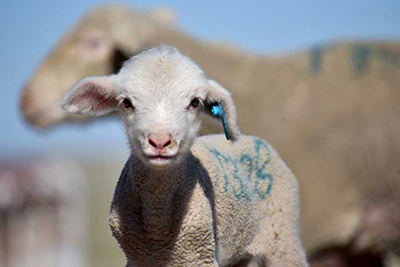 Late April is lambing season, the busiest time of year at Reed Ranch, and all hands are on deck. Ewes are giving birth to singles, twins and triplets in wooden pens under the watchful eyes of Beverly and Tonya, Jewell’s daughter- and granddaughter-in-law. Outside, lambs and ewes are temporarily separated while Corrine and Garrison, Jewell’s great-grand-niece and nephew, and great-grandson Ben, form an assembly line. They present the lambs one-by-one to Jewell’s son, Tom, who, despite having a freshly broken shoulder, vaccinates and tags them. Later, Tom will take the lambs and their mothers out to pasture for the summer. After wrapping up their tasks, over a dozen family members arrive inside, discussing the work of the day and what tasks remain to be completed after lunch. Matthew, the youngest present member of the Reed clan, takes his typical seat on Jewell’s left as his mother, Tanya, fills his plate. “It’s not too often we get to have lamb for ourselves,” Tanya says with a knowing smile on her face. Everyone joins hands to form a circle of prayer and bows their heads as Beverly says grace. No plate is left unclean. Jewell cleans up while the rest of the crew returns to the field. She’ll have a short afternoon siesta before taking her 4:00 cruise through barn. Jewell Reed’s way of life reflects what she believes is important—her family, her values, the ranching way of life, and the preservation of her home in the Thunder Basin grasslands. And even if you’ve never smelled the sagebrush in Wyoming or spent time over lunch with a rancher, Jewell believes that you and her likely have something in common. As sunset closes in on Reed Ranch, another day is almost done. But before the sun takes its leave it illuminates something moving: a bird, lighting on a fence post. It lifts its head and begins to sing.